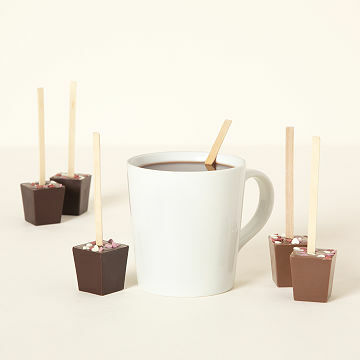 Give them some cozy comfort with this hot chocolate trio with fall-in-love flavor. Not every chilly day is created equal. Maybe it's "We took the long way home" cold. Or "I can't feel your kisses" cold. For any kind of cold they may be coming in from, this hot chocolate trio will give them cozy comfort. Choose from either Belgian Milk Chocolate or French Dark Truffle: Each stick is a single serving—just stir it into milk or water—and made from couverture (fancy for "finer grounds and more cocoa butter") chocolate. Topped with candy hearts, they make a sweet treat for nights in. Created by Tyler Geertsen. Handmade in California. Many of us can claim being lifelong lovers of chocolate. Not many of us, though, can claim we turned it into a business. It’s what happened, though, when a few family and friends discovered this sweet similarity. It all happened when Tyler Geersten, a business grad, met sisters-in-law AmberLee and Andrea. In college, Tyler was known as "the guy who cooked up actual real meals and sat down to them for dinner." He easily transitioned to dessert, and the trio began making choco-licious treats after "years of dreaming and many late night conversations while lingering over steaming mugs of delicious hot chocolate." Tyler lives with his wife and three kids in the foothills of Northern California, where you’ll find him gardening, coaching his children’s sports teams, and, of course, enjoying chocolate. Store at room temperature. Do not refrigerate.